Jack’s in a rut. Depression and severe anti-social behavior has whittled down his existence to sleeping and watching television. Seeing the human race as little more than meat with a pulse, Jack has no interest to bond with anyone. There’s little purpose for him to make friends with someone he’d eventually eat or outlive by more than a millennia. The fuse is lit when Jack’s past comes back to rattle him. Jack must now walk a tight rope of sobriety and try to eat as few people as possible in this violent tale of personal responsibility. “My landlord thought I was robbing my own appartment. A brilliant, original horror. 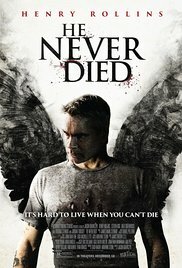 That’s what you might say after watching “He never died“. A subtle mix of sometimes gory images and clever humor. And this shown in an even surprising way by Henry Rollins, the former frontman of the legendary punk band “Black flag”. A bundle of muscles who already surprised in the past with his poetry. And now he shows that he’s also capable to take a leading role for his account. His stoic calmness and indifference create hilarious situations several times. And the story on his own is contrived in such an original way. I watched with amazement and after a while I was wondering what the hell it was about anyway. Did it have something to do with vampirism? Was Jack a solitary zombie (due to his grayish look) who attempts to remain anonymous? And what about those demonic and satanic sounds he sometimes makes? Rollins is a performer and this movie was the appropriate stage for him. His imperturbable gaze and brute force gave him a Schwarzenegger-like appearance. The limited conversations with brief, evasive answers contributed to the overall tone of this absurd film. A fatal head injury made such an impression on him as a tiny splinter in his finger. Unmoved he uses pliers to treat the injuries. At that time I wondered whether it was meant humorously or creepy. He’s an emotionless bloke who storms through a decaying society like a bulldozer, full of rage and aggressiveness. At first Jack seems to be a dull figure, but when his true identity is revealed in the end, his way of reacting and his world-weariness is justified.